The raccoon (Procyon lotor), sometimes spelled as racoon, is a medium-sized mammal native to North America. As a result of escapes and deliberate introductions in the mid-20th century, raccoons are now also distributed across the European mainland, the Caucasus region and Japan. Their original habitats are deciduous and mixed forests, but due to their adaptability they have extended their range to mountainous areas, coastal marshes, and even urban areas, where some homeowners consider them pests. With a body length of 41 to 72 cm (16.1–28.0 in) and a weight of 3.6 to 9.0 kg (7.9–19.8 lb), the raccoon is the largest procyonid. The dense underfur, which insulates against cold weather, accounts for almost 90% of the raccoon's grayish coat. Two of its most distinctive features are its extremely dexterous front paws and its facial mask, which are also themes in the mythology of several Native American tribes. Raccoons are also noted for their intelligence; studies have shown that they are able to remember the solution to tasks up to three years later. Raccoons are omnivorous and usually nocturnal; their diet consists of about 40% invertebrates, 33% plant foods and 27% vertebrates. Captive raccoons sometimes douse their food before eating it, which is most likely a vacuum activity imitating foraging at shores. Though previously thought to be solitary, there is now evidence that raccoons engage in gender-specific social behaviors. Related females often share a common area, while unrelated males live together in groups of up to four animals to maintain their positions against foreign males during the mating season and other potential invaders. Home range sizes vary anywhere from 0.03 km2 (0.01 sq mi or 7.4 acres) for females in cities to 49.5 km2 (19.1 sq mi) for males in prairies. After a gestation period of about 65 days, two to five young are born in spring. The kits are subsequently raised by their mother until dispersion in late fall. Although captive raccoons have been known to live over 20 years, their average life expectancy in the wild is only 1.8 to 3.1 years. Hunting and traffic accidents are the two most common causes of death in many areas. Raccoons usually mate in a period triggered by increasing daylight between late January and mid-March. The average litter size varies widely with habitat, ranging from 2 to 5 pups. The pups are blind and deaf at birth, but their mask is already visible against their light fur. The birth weight of the pups is between 2.1 – 2.6 oz and are about 3.7 in long. Their ear canals open after around 18 to 23 days, a few days before their eyes open for the first time. Once the kits weigh about 2 pounds, they begin to explore outside the den, consuming solid food for the first time after six to nine weeks. Due to its adaptability, the raccoon has been able to use urban areas as a habitat. They den in attics, walls, sheds, barns, and chimneys, annoying people with their noise and odors. Raccoons usually gain access via overhanging branches, power lines, or by climbing up the siding. They may fall into chimney and furnace flues, thus gaining entrance to the basement or interior of the house. Their nest materials might block a vent, causing a fire hazard. They chew and scratch wires (another fire hazard) and also damage attic vents, eaves, screens, bird feeders, siding and insulation. While overturned waste containers and raided fruit trees are just a nuisance to homeowners, it can cost several thousand dollars to repair damage caused by the use of attic space as dens. 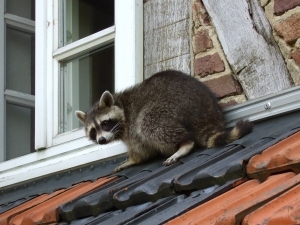 Relocating raccoons without a permit is forbidden in many urban areas on grounds of animal welfare. Loud noises, flashing lights and unpleasant odors have proven particularly ineffective in driving away raccoons. Typically, though, only precautionary measures to restrict access to food waste and denning sites are effective in the long term. Raccoons can carry rabies, a lethal disease caused by the neurotropic rabies virus carried in the saliva and transmitted by bites. Its spread began in Florida and Georgia in the 1950s and was facilitated by the introduction of infected individuals to Virginia and North Dakota in the late 1970s. Among the main symptoms for rabies in raccoons are a generally sickly appearance, impaired mobility, abnormal vocalization and aggressiveness. There may be no visible signs at all, however, and most individuals do not show the aggressive behavior seen in infected canids; rabid raccoons will often retire to their dens instead. We encourage people to stay away from animals with unusual behavior or appearance, and to notify the proper authorities, such as an animal control officer from the local health department. Since healthy animals, especially nursing mothers, will occasionally forage during the day, daylight activity is not a reliable indicator of illness in raccoons. Unlike rabies and at least a dozen other pathogens carried by raccoons, distemper, an epizootic virus, does not affect humans. This disease is the most frequent natural cause of death in the North American raccoon population and affects individuals of all age groups. It may occur along with a following inflammation of the brain (encephalitis), causing the animal to display rabies-like symptoms. Some of the most important bacterial diseases which affect raccoons are leptospirosis, listeriosis, tetanus and tularemia. Although internal parasites weaken their immune system, well-fed individuals can carry a great many roundworms in their digestive tract without showing symptoms. 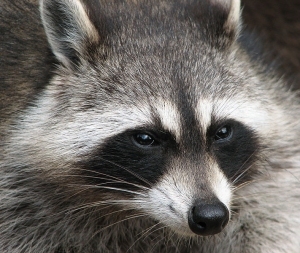 The larvae of the Baylisascaris procyonis roundworm, which can be contained in the feces and seldom causes a severe illness in humans, can be ingested when cleaning raccoon latrines without wearing breathing protection. Cleanup of areas affected from defication of raccoons should be left to professionals.